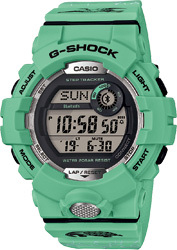 The Fukurokuju Model of the seven models in this series is based on the GBD-800 of the G-SQUAD G-SHOCK sports lineup. The band is decorated with a light green a little green pine pattern that also includes auspicious images of cranes and turtles. The band ring is imprinted with three symbols that represent good fortune, wealth, and longevity. The GBD-800 base model features a multi-segment digital display to improve readability and operation while engaged in sports. The LCD is divided into upper, middle, and lower sections, and there is a digital dial in the upper right. Each display area shows different, measurement, timekeeping, and other information, which provides useful data about your daily activities. This watch links with the G-SHOCK Connected phone app to provide access to a number of functions that enhance workouts. Daily health and fitness support functions include a 3-axis accelerometer that keeps track of step counts, a Multi-Timer that lets you create up to 20 timer combinations of five timers each, memory for up to 200 lap records, and more. Illuminating the display causes the letter K of the G-SHOCK name to float in the LED backlight glow. Each of the Seven Deities of Good Fortune models displays a different character that together spell out the name G-SHOCK. The Seven Deities of Good Fortune represent a blend of indigenous Japanese religion and Buddhism into a uniquely Japanese belief. 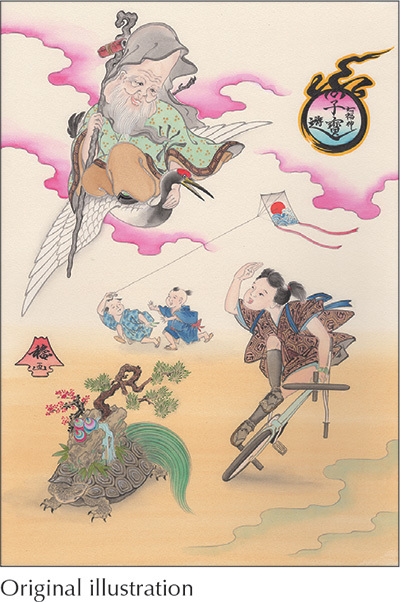 This divine group consists of the seven gods named Ebisu, Hotei, Benzaiten, Bishamonten, Daikokuten, Jurōjin, and Fukurokuju. These deities have their origins in ancient gods of fortune in Hinduism, Buddhism, Daoism, Shinto, and other sources. According to the Humane King Sutra (Humane King State-Protection Perfection of Wisdom Sutra), paying homage to these deities will serve to avoid seven misfortunes and be blessed with seven fortunes. This belief began around the end of Japan's Muromachi Period. It became a popular belief among common people during the Edo Period, and has been handed down to modern times. Fukurokuju is the God that deifi ed in Taoism of China, Soh. A long head, a long beard and big lobes are characteristics and always with a crane and a tortoise. As the name of "Wealth: (fuku)", "Allowance: (roku)" and "Long Life: (ju)" shows, he will bring a happiness, a fortune and a long life. There is a case to identify him with Jurōjin.